Vince is a young adult with the diagnosis of cerebral palsy. 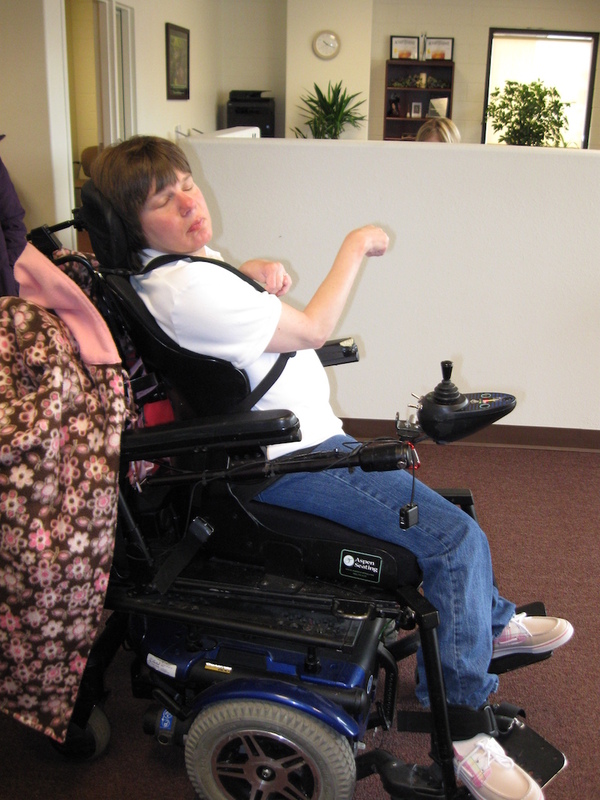 He had significant muscle tone throughout his body and frequently extends in his current wheelchair seating system. We were anxious to explore dynamic seating options to diffuse some of this extensor tone. However, Vince had very little hip flexion or extension beyond his current seated position and, as a result, he could not benefit from a dynamic back which allows movement past this point. He had no knee extension past 90 degrees and his range limitations prevented him using even the telescoping feature of a dynamic footrest. We were unsure if we could provide any dynamic intervention when Vince broke yet another head support. We decided to try a dynamic head support hardware. With the addition of this dynamic component, we found that Vince’s head was in an aligned position most of the time, rather than his typical hyper-extended position. He experienced less force through the cervical area, as well, which we hoped would protect his neck from injury and increase his comfort. His overall extensor tone and posturing improved when force was diffused at his neck. Finally, Vince has yet to break his head support hardware since “going dynamic”! If Vince had adequate range of motion, we would have also recommended a Dynamic Rocker Back and Dynamic Footrests due to his extreme tone. In combination with Dynamic Head Support Hardware, this would have provided a very effective solution. Due to range limitations, Vince could only use the Dynamic Head Support Hardware. Even this lone dynamic component diffused forces, reduced overall tone and posturing, and improved head position.